As previously mentioned, the first stops on our scheduling discovery trip through the U.S. were to explore flex-mod schedules in Sheboygan, Wausau and Merrill, Wisconsin. Next we headed west to Hudson, Wisconsin to explore some block scheduling. To be honest, we were a bit apprehensive. We’d just had our minds blown by the intricacies of flex-mod and thought of block scheduling as its simpler, less exciting cousin. It had also received some mixed feedback from our staff, which I will discuss below. However, we were pleasantly surprised and found in block scheduling a model that might help meet needs that flex-mod does not. The core reason why ASFM would move toward block scheduling is to allow and encourage teachers to vary instructional methods and incorporate project based learning. Several of our teachers and admin are very excited about PBL and we’ve had whole-staff professional development aimed at encouraging teachers to develop project-based units; however our schedule, by chunking class blocks into only an hour and sending students to six classes a day somewhat restricts the interesting things that a teacher can do with one class period. Students also move their focus from class to class often and have to keep up with seven classes at all times, which may be good for time management skills but I doubt leads to in-depth exploration in any one subject. 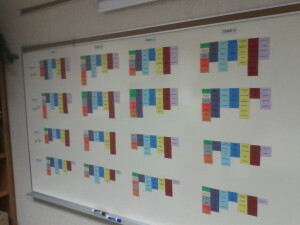 Scheduling classes isn’t easy when you have four terms to consider! Block scheduling tries to find a better balance. Usually implemented (at least in its pure form) with students taking four 90-minute classes per semester, it gives teachers longer, more intensive instruction with which to deliver varied, inspiring instruction, and it allows students to focus on only four classes at a time. At ASFM, this could help alleviate the high student stress levels and encourage deeper learning rather than cramming for tests. Of course, all the promised benefits depend on teachers living up to the promise of the longer period and effectively pacing and instructing their courses, which will require a great deal of professional development before the schedule can have a positive impact. The experiences of two schools in Boulder which implemented a modified block schedule (not quite the same as a 4-by-4 block but with a longer instructional period once a week) are instructive: the school that implemented a staff-wide PD program now reports high levels of staff satisfaction and creative teaching methods, while the school that failed to implement similar PD is finding mixed results. All of the above were things we knew before visiting schools; what we didn’t expect was the increased focus on student flexibility. In a straight-up 4-by-4 schedule, the addition of an eighth class would provide an immediate increase of flexibility for students, who could take a study hall, enrichment class, or another elective depending on their needs. Student who want to accelerate could take two back-to-back courses in a year, perhaps giving them better flexibility for AP courses or electives in their senior year. On the other hand, students who failed a course could remediate it in the next semester without setting themselves behind in that subject, which may allow ASFM to improve its system of remedial exams, projects and classes. As well, though it’s difficult to say by how much without running full-school simulations, an eighth period would help eliminate some of the conflicts which come about having two “singleton” classes (i.e. only one class offered) run in the same period. However, in one of the schools we visited, the emphasis on student flexibility didn’t stop at the 8th class, and also helped to address one of the central critiques of block schedules that we have heard from our own teachers: that students may lose too much knowledge in a subject if they have a whole semester without learning it. I acknowledge that this is a valid point, though perhaps overstated. (How much difference does a 6-month semester gap vs. a 2-month summer gap make?) However, in the discourse around ASFM’s schedule explorations it was usually used as a blanket statement dismissing block scheduling, and I would like to qualify it a bit. First, I think it applies to some students much more than others, and I would posit that the students teachers are concerned about in this case are the same students teachers are always concerned about; i.e. those who struggle with school in general. Second, I would think it applied to some subjects more than others, specifically subjects where constant practice is vital such as music and languages. Math is sometimes lumped in with this, though as a math teacher I disagree somewhat: I’d prefer my students to gain a deeper relational understanding of math which will stay with them rather than a repetition-based procedural understanding which requires constant practice. In any case, River Falls High offered a view into a solution that some schools with block schedules have adopted: ‘skinny’ courses. In this model, students have the option to split some blocks into two classes (45 minutes/day) that run for the whole year rather than one semester. It’s a compromise between a block system and our current schedule, and helps the students that need a slower pace of instruction and regular exposure in certain classes while still allowing most students in most courses to gain the benefits of the more intensive instructional period. At River Falls, the school had decided to cap the number of students in skinnies at a lower number than in their regular periods in order to mitigate the difference of number of students per teacher (3 blocks x 30 students = 90 students; 2 blocks + 2 skinnies x 30 students = 120 students); this also helps ensure that students who have specifically requested skinny courses enjoy lower class sizes as well. In a block model with skinny courses, many students would take all block courses with no skinnies. Some would take a study hall, some would challenge themselves and advance in a core subject, and some would take an extra elective. Some students would take two skinny courses (along with 3 block courses each semester) in order to get year-round exposure to a subject in which they struggle. Students with resource needs could schedule a skinny block with a resource teacher so they have aided work time each day throughout the year. Not all learners are the same, and a block schedule with skinnies helps give students some choices in how they arrange their required and elective courses. This model is not perfect: it may be difficult to schedule and requires some teachers to teach the same class at two different paces simultaneously, which could be considered an extra ‘prep’. It also does not by default give students the kind of autonomous work time and teacher access that flex-mod does, though this could be built in via study halls or a fixed-time teacher access period. However, if we’re serious about giving students choice and encouraging teachers to move towards varied teaching methods, then we should give a block schedule a serious look.